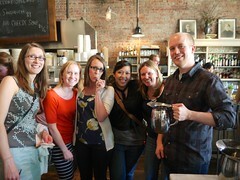 ...because Tuesday I was winner of the Crowd Favorite award in Oddfellow's 3rd Annual Whoopie Pie Bake-off. I can now say I am an award-winning baker. I was pleased as punch at the turnout of all my friends and co-workers (my office is right upstairs!). 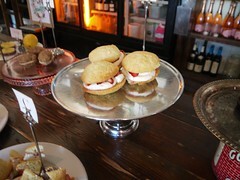 But if I don't say so myself, the lemon lavendar whoopie pies that I entered were pretty darn tasty. Like unicorn rainbows in your mouth! 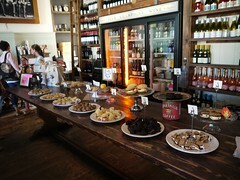 There were about 7 contestants total, and we had 2-3 whoopies on display then a bunch of tasters in front. They were labeled A-G (mine=E). The crowd went through, tasted, and then voted. Strawberry Shortcake. This one taste liked summer and was quite delicous. I found this guy works at Oddfellows as a baker/server. Oddfellows has some pretty tasty treats in the pastry case, so no wonder I liked thie one. One of my favorites (besides my own, of course), was the sweet potato spice with caramel filling. It was all the fall flavors that I love. I got the chance to chit-chat with the baker and get the recipe. Friends, I'll make these for you sometime this fall - so tasty. 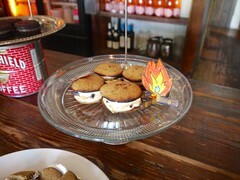 Another whoopie was the scortched s'mores. Very cute though with it's campfire decoration, and quite deserving of Most Inventive. Mine, Crowd Favorite, was the most loved by the people ... also the most delicious (in my humble opinion). If there was a reward for best decorated, I think I would have won that too. 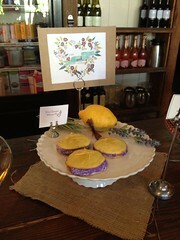 I had down to the fine details like candied lemon peel on top, a cute sign, actual lemons, and lavendar - looky here. I'm awesome (again, this is said in the most humbly-speaking voice possible). Ahh, I've let it get to my head. Seriously though, they were ALL delicious whoopie pies. The best part of the whole experience was ... I had a blast. I really enjoyed trying to make whoopie pies for the first time. Trying to get the recipe just right was a fun challenge that kept me busy in the kitchen. 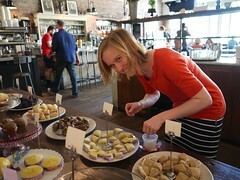 Plus, I got to enjoy some time on a nice afternoon with fellow bakers and friends. Who can beat that? Thanks Oddfellows!